Madison’s “Bee Fest” kicks off the beginning of Pollinator Week, June 15 – 21, 2015, a week dedicated to highlighting the importance of bees, bats, birds, butterflies and other pollinators. A dramatic drop in the number of honeybee colonies in recent years drew dozens to the UW Arboretum on Sunday to understand that trend and how to encourage more pollination in Madison. About 60 people spent their Sunday learning about pollinating insects and animals — which are not restricted to bees — and how to monitor their numbers in to help researchers track them. The event was hosted by the Wisconsin chapter of the Society for Conservation Biology and is part of a larger effort to track populations of pollinating insects in the city. More than 60 percent of Wisconsin’s honeybee hives have died since April of last year — higher than the national average, according to a recent survey conducted by a partnership that includes the U.S. Department of Agriculture. Now, the group is cataloging different species of pollinating insects with a focus on the rare rusty-patched bees and yellow-banded bumblebees in the Lakeshore Nature Preserve, which stretches along Lake Mendota’s University Bay between Muir Woods and Picnic Point. Sunday’s event was the kickoff of that effort, chapter member and event organizer Wynne Moss said. “One thing that’s challenging about studying changes in communities over time is that we often don’t have baseline data,” said Jesse Miller, a UW-Madison graduate student and botanist who researches grasslands and biodiversity patterns. Many of those attending Sunday’s event learned how to catch and identify insects using nets, special insect vacuums and by creating traps in cups of soapy water. Attendee Keefe Keeley is the executive director of the Savanna Institute, a nonprofit based in Urbana, Illinois, that is focused on developing restorative agricultural systems. Keeley said the effort will help ongoing research into bee hive collapse. Anitra Johnson of Madison, a retired landscape gardener, plans to help monitor the insects, too. On Sunday, she caught three species of bees that were drawn to baptisia and wild rose plants. 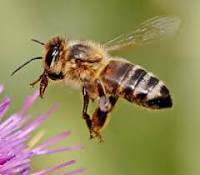 A major contributing factor to the declining bee population is a reduction in native plants they prefer, Miller said. “In order to conserve pollinators, we have to conserve our natural habitats, and native plant gardens can be one way to do that, in addition to conserving the wild lands,” Miller said. Miller said agricultural land has largely replaced savannas and prairie lands, especially in southern Wisconsin, diminishing the number of plants that flower at various times throughout the year. “It’s not only having a native habitat but having a diverse enough native habitat that you have nectar throughout the summer, and that’s hard for a lot of gardeners to recognize and know when things bloom,” Moss said. EPA is joining other federal agencies, the National Wildlife Federation, the Pollinator Partnership (pollinator.org) and many more organizations in the Million Pollinator Garden Challenge (http://millionpollinatorgardens.org/) to promote pollinator health.